Are you part of the game development community? Being active in game development forums and the indie scene is one of the best ways to get better at making games. Joining and participating in game development forums can ignite your creativity and help keep you motivated to succeed. The more immersed you become in the game development community, the easier it will be for you to come up with killer game ideas and start crushing it in the App Store. When you join game dev focused forums, you get to connect with others and share not only ideas, but your experiences as an indie too. There are some things that only an indie dev will understand. Forums are great platforms to chat and connect with people working towards the same goals. They’re also learning resources for all things game dev. It’s pretty amazing, how much you can learn by browsing the message boards on game development forums. You can learn how to make game art, your app icon, techniques for marketing your mobile app, the things indie developers should do and not do, app monetization tips and much more. The resources that you can find on forums are endless. You also can ask questions and gain valuable input from others who enjoy games as much as you do. Indie game development forums are ideal for networking too. You can use them to help create a fan base around your upcoming game, build relationships with other indie devs and open the doors up for future collaborations. 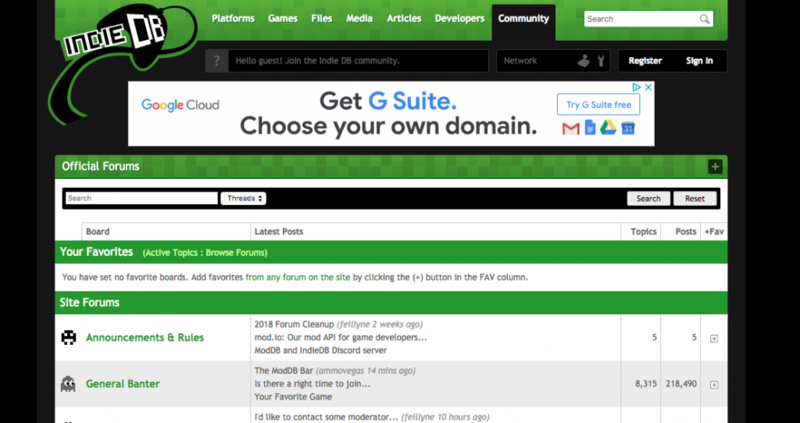 So without further ado, here’s our list of the best indie game development forums to join! If you’re a Boxer or just interested in learning more about how to use Buildbox, our official forum is a good start. When you come across something you don’t understand or need some game dev guidance you can browse and ask questions in the ‘How Can I …?’ section. The message boards on gameplay, game design, game marketing, and advertising are also loaded with helpful information. There’s also a special Showcase section where you can post links, screenshots, and videos of your games or works in progress to gain valuable feedback. Similar to our Discord server you can connect with other indie developers to talk games, share ideas and tips. You can find the latest updates and mini-tutorials on Buildbox 3D on the forum as well. 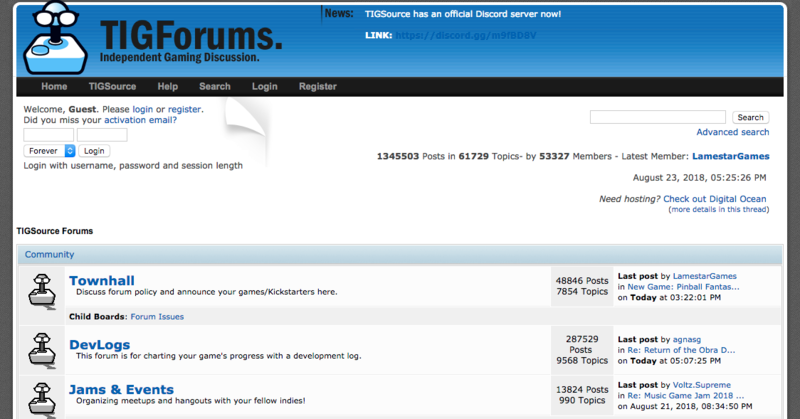 The TIGSource forums are a major stomping ground for indies in the game development community. In fact, it was Minecraft creator, Markus “Notch” Persson’s favorite forum. During the development of Minecraft, he was an active member of TIGSource, regularly sharing updates on his upcoming game and asking for feedback. 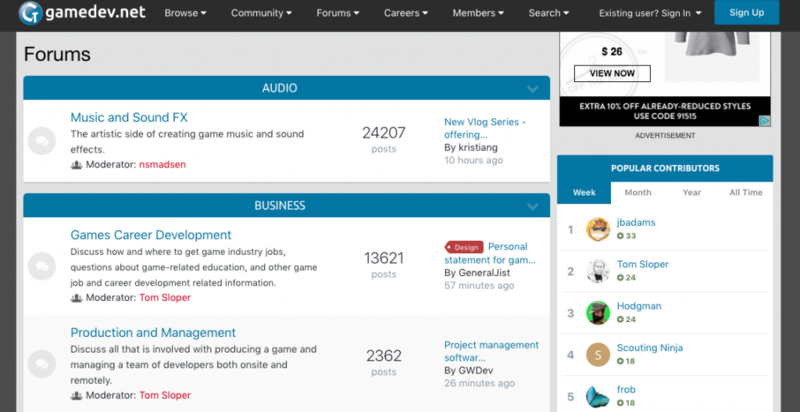 This large active forum covers all topics related to game development. There’s a DevLog board that you can use like Notch to post about your game’s progress. With TIGSource’s forum, you can also post your games in the Playtesting section to receive feedback on design and any potential bugs. Along with the standard art, audio, design, and technical boards, there’s a job section. In the job section, you can post and find paying jobs for game artists or coders or even unpaid collaborations. 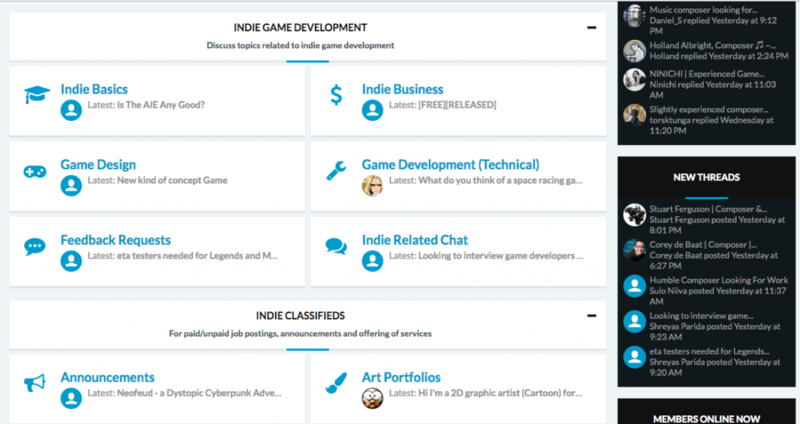 The game developer forums on GameDev.net are also a popular place for indies in the game development community to hang out. If you want to learn all the different aspects of making games it’s definitely worth checking out. You’ll find topics on career development, video game design tips, coding, creating game art, music and sound effects. It also features a Game Business and Law board that discusses all kinds of business and legal issues that game developers might encounter including contracts and copyright issues. This forum also has a GameDev Challenges section where users can participate in various game development challenges to improve their skills. 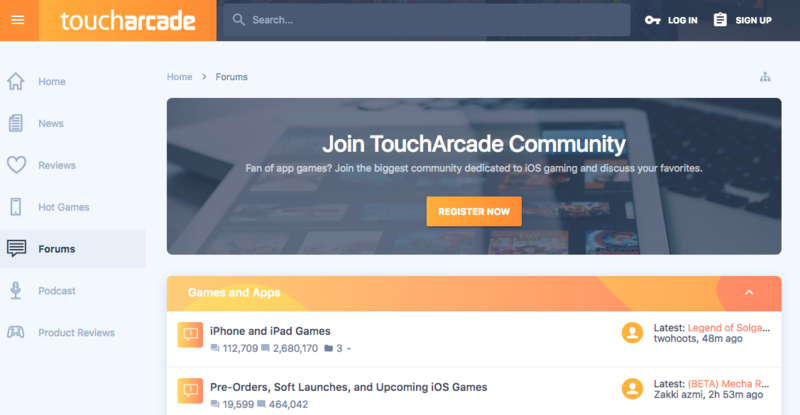 TouchArcade is one of the biggest communities dedicated to iOS gaming. Their forum is another excellent resource for game devs to use. You can discuss the hottest trending mobile games, check out their reviews, and discover indie games that’ll inspire you. There’s also a public game developers forum where you can browse and ask questions. You can find tips on how to finish your game and much more. Another platform where you can connect with other indies and talk about game development is Reddit. 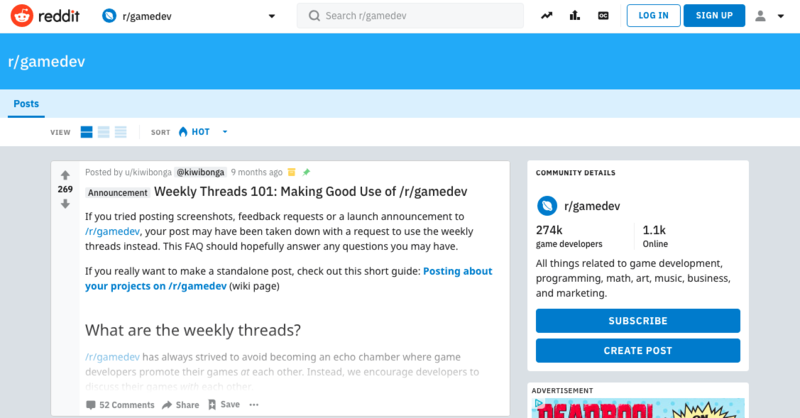 They have a section called r/gamedev that you can browse to find interesting discussions on making games. There are links to in-depth articles, questions, and tips on everything from programming to marketing your games and sometimes even free music and sound effects. The Indie Gamer forum is part of a game development community devoted to indie devs, artists, and composers. They cover the indie basics, game design, and various programming topics. There’s also a business section where you can learn about ways to increase your app downloads and different marketing tips. Indie Gamer Forums also features classifieds that you can browse to find artists to create art for your games or skilled music composers for unique soundtracks and effects. There’s an unpaid and profit sharing message board available too for those indies looking for some additional help. The IndieDB forum is also a favorite among game developers. Their game development forums cover a broad range of topics from simple development banter to more complex talks on coding, 3D modeling, and animation. You can learn about level design plus tips for making game graphics and audio. Most forums are excellent resources for finding free assets and bundle packs that you can use in your games as well. However, when it comes to indie game development forums, don’t rely on only one. Pick several different forums and become an active member. You’ll be surprised by how much you’ll be able to learn. Remember, consistency is key. It’s one of the game dev secrets to indie success. So, make it a habit to visit your favorite forums on a regular basis.